Returns a brief description of the file type that can be parsed. Returns a string with the accepted file extensions separated by a whitespace and in small caps. Return magic bits used to determine file format. Base class for reader modules. Reader modules access persistent data and pass them to the desired data structure by the means of a BaseImporter derivative. All reader modules must be derived from this class. Returns true if writer can parse _filename (checks extension). 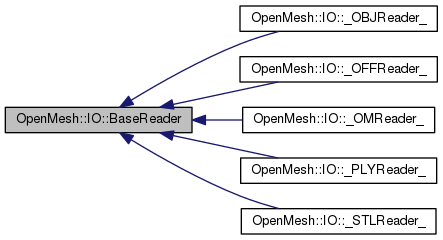 Reimplemented in OpenMesh::IO::_OFFReader_, OpenMesh::IO::_PLYReader_, and OpenMesh::IO::_OMReader_. Reads a mesh given by a filename. Usually this method opens a stream and passes it to stream read method. Acceptance checks by filename extension can be placed here. Implemented in OpenMesh::IO::_OFFReader_, OpenMesh::IO::_PLYReader_, OpenMesh::IO::_STLReader_, OpenMesh::IO::_OMReader_, and OpenMesh::IO::_OBJReader_. Reads a mesh given by a std::stream. This method usually uses the same stream reading method that read uses. Options can be passed via _opt. After execution _opt contains the Options that were available. Please make sure that if _is is std::ifstream, the correct std::ios_base::openmode flags are set.